This one is a personal "I Told You So" to one Gordon Pepper. When I found out last summer that Martha Stewart was going to have her own version of "The Apprentice", I said to Gordon that it would be "the biggest bomb of the 2005-2006 season". Okay, that title belongs to "But Can They Sing." But the bomb exploded this week as both Stewart and Trump are trying to assign blame as to why the show failed. Stewart said in this week's Newsweek that the original plan was to have Stewart "fire" Trump on the show and then have her version be the flagship. She blamed him for the failure of her version, because he wouldn't step aside. Then on Tuesday, according to the New York Daily News, Trump fired back by calling Newsweek, saying, "What moron would think you're going to fire the guy with the No. 1 show on television?" and sending Stewart a letter on Tuesday branding her a "liar" and saying that her lies were akin to the insider-trading scandal that sent her to jail. On Martha's syndicated talk show on Wednesday of this week she said, "I'm hurt and I'm really very upset at my longtime friend and that's really all I want to say. Enough about it." Then Mr. Trump goes on CNBC and said "What I didn't like is that I defended Martha many, many times and I never got a note. I never got a phone call saying, 'Donald, thank you very much. See, you get a little bit tired of it. Then when her show fails, she blames me on top of everything else." To me, this is the biggest story of the week. I usually don't revel in show's failures. But in this case, Trump is right. Let me count the ways. a) by having two shows on, you dilute the show's audience. b) Stewart's persona was being massaged by having her version on, not as a true business show. c) The Apprentice IS Donald Trump. Having him fired would have been a STUPID idea. Sorry Martha--in the battle of egos, you just brought a knife to a gunfight. Its amazing what 4 million people and change can do to a friendship. Donald Trump and Martha Stewart have decided to not play nice in the sandbox anymore - this after they were both buddy buddy as they were promoting each others show. After the ratings show up, Martha gets the gate due to her lack of ratings, while The Donald (who does have sagging ratings of his own) gets to be moved to Mondays. However, the Donald isnt done there. Instead of sending the Martha on her way, the Donald decides to tar and feather her first as he slams her in the media. Martha, of course, decides to fire back, and its on like Donkey Kong. But since Martha is no longer on the air, and Donald is in danger of joining her, it seems like the two big gorillas are left to fight over what appears to be half of an already eaten banana. My colleague Jason Block says that Martha Stewart is to blame for this mess, but is she really? Lets really look at whats going on here. We all agree that one of the main parts to the shows demise was the replacement of Martha with Martha-lite. By the middle of the series, when Martha really bared her claws, the show was getting good, but by that point, it was too little too late. Sure, you could blame it on Martha, but I choose to blame it on the producers and the people who told her to act in that sort of fashion. Martha got very poor advice and she paid for it dearly. She also got poor council on another area  the contestants. I dont think any of those candidates make it to The Donalds Boardroom, save Jim, who is probably one of the first three to go. Therein lies the next problem of the show. Sure, this is a job interview, but this is also a game. Sure, the manipulative, sneaky and sometimes sanity-questionable Jim had no prayer to win this competition, but Jim is one of the best people to play this game in a long long time, and perhaps the best ever. The strategy of pitting up the good people against each other to start eliminating them was genius, and the frustration of Martha Stewart not being able to hire who she really wanted to was all thanks to Jim, who forced Martha to oust some of the better players early. But the fact of the matter is that there should have been 16 worthy contestants there, and there clearly wasnt. That falls on the head of the contestant coordinators, who should have been much more concerned in capability than diversity. I dont see how Martha Stewart could have truly thought that we would be buying her statement that the show was only supposed to be on for one season when the idea was for her to fire The Donald. Hmmm? Apprentice 5, Monday, February 27, 2006. I guess being in the news is good enough to get some more publicity for the show, and I guess that if its all to get ratings for a struggling franchise, then thats all that matters, regardless of how many egos you bruise or how many lifelong friendships you shatter. But then again, that should be a commonplace theme for a show with the tagline: "It's nothing personal... it's just business". 1. One of the main events has been confirmed. That one would be the amazing run of Thom McKee as he did to Tic Tac Dough what Ken Jennings did to Jeopardy. Included in the discussion will be McKee, as well as Wink Mr. Orbitz Martindale, and others to be named later. 2. The Ralph Edwards award will be given this year to Betty White, who will be honored at a luncheon. The Bill Cullen Award will be going to her late husband Allen Ludden. 3. We will be having a LIVE version of Whats my Line over at the Convention! Yes, Beat the Geeks J. Keith Van Stratten will be bringing the panelists over. Those are the new items that were discussed. The old items (Battle Buzzer, Game Show Tournament, WLTI, etc.) are still there. When we return to this next month, there should be a more solid schedule, as well as more of an idea on what shows will be taping in the area. 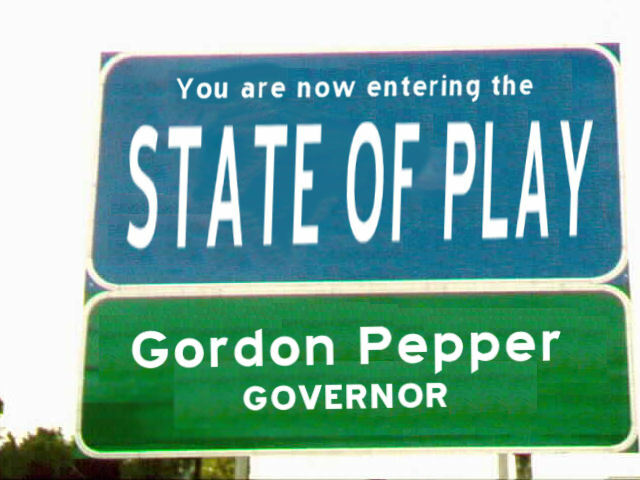 Gordon Pepper is more than happy to send Jason Block into the fray to avenge his UTOC snub... E-mail Gordon at gordon@gameshownewsnet.com. E-mail Jason at jb.regis@verizon.net. Opinions expressed in State of Play do not necessarily reflect those held by Game Show Newsnet as a whole. ALL ORIGINAL MATERIAL COPYRIGHT 1999-2005 GAMESHOWNEWSNET.COM. All rights reserved.